Just a little somethin’ to end your evening on a sweet note! 1. Rinse and drain excess water from the strawberries. 2. Mix the brown sugar and cinnamon in a medium-size prepping bowl. Set aside. 3. Start by dipping the strawberry (one at a time) into the cup of plain yogurt approximately 3/4 of the way. 4. 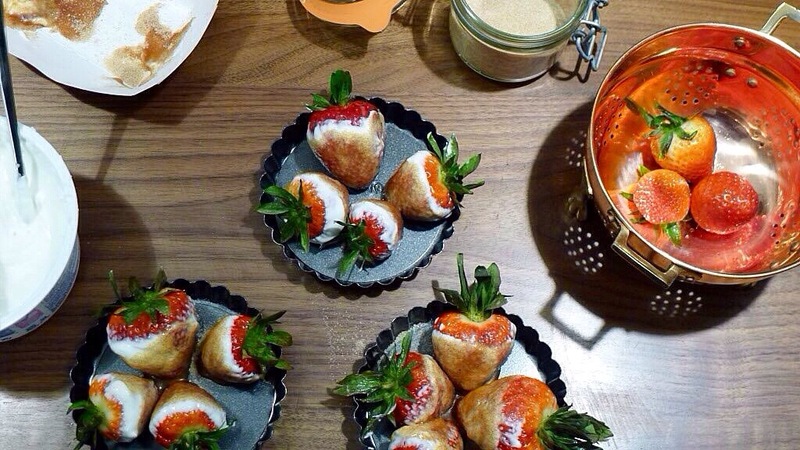 Next, roll each yogurt-dipped strawberry into the brown sugar/cinnamon mix. 5. Arrange on a large serving plate or in individual tart pans (as pictured); then refrigerate for approximately 20 minutes before serving. Substitute the brown sugar with wheat germ or chia seeds for an even healthier version! Posted in Desserts and tagged food trends, foodies. Bookmark the permalink.